Bruce Willis as a troubled cop and Mos Def as a fast-talking criminal working together to survive an onslaught of corrupt cops. Doesn’t sound particularly unique in the world of action flicks. 16 BLOCKS, however, attempts to be something slightly more. I watched 16 BLOCKS (2006) on 6.11.13. It was my second viewing of the film. Detective Jack Mosley (Willis) is an apathetic cop trying to get through the day without ever being too sober. He limps constantly, he can’t go too far without getting out of breath, and he is mostly apathetic to everything happening in the world around him. He gets stuck transporting a criminal named Eddie Bunker (Mos Def) to court for some Grand Jury testimony. Mosley doesn’t really want anything to do with the assignment, but he is forced to take it. He’s got two hours to get Bunker the 16 blocks from the prison to the courthouse. Seems like a routine enough job. Unfortunately there are some bad guys, mostly bad cops led by the wonderful David Morse, who would like Bunker dead. The tone of this film, directed by Richard Donner, is less LETHAL WEAPON and more NARC. While 16 BLOCKS is not a heavy film by any stretch, Willis plays Mosley as such a curmudgeon that the only optimism in the film comes from Mos Def, whose Bunker is a life long criminal trying to do the right thing. The trap would have been to make this a buddy comedy by half way through. Donner avoids that cliche, instead allowing Willis to play one of the more subversive characters of his career. He’s not a good guy doing a good thing. He’s actually a terrible and careless alcoholic who decides he’s not going to be an observer anymore. It’s arguable that he takes on the task wanting to be killed in action. While he acts instinctively and defensively, his apathy extends to whether or not this will be his last day alive. The movie gets derailed slightly with an extended scene on a bus. At that point, with Mosley having the opportunity to expose some corrupt cops with a police negotiator and get someone trustworthy to take Bunker to the courtroom, he instead chooses to play it tough. The decision feels like a movie device rather than an organic byproduct of the action on screen. Writer Richard Wenk wrote himself into a corner there, somewhat. The rest of his script, however, is decidedly good. And because the bus sequence proves to not be the climax, the movie is able to recover. I watched the director’s cut with the more appropriate and more difficult ending. The theatrical release ends in a typical Hollywood manner. I saw the theatrical cut first, and wasn’t a huge fan of the ending. I would highly recommend the director’s cut for anyone giving this a first go. The movie is more effective with that conclusion. So this is a pretty good little movie. 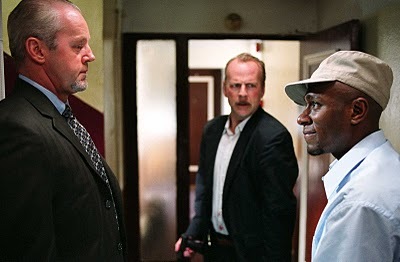 I like Willis’ role, I like Mos Def, and I always love me some David Morse. Solid enough script, intense enough action, good suspense. Not an all time great by any means, but certainly worth seeing. ~ by johnlink00 on June 12, 2013. I always forget about this movie – I liked this thing – nice work! Thanks! Willis rarely makes an unwatchable movie. Nice review. I stumbled across this on tv a few years ago and really liked it.